Refrain from eating and drinking on your buses. Spilled beverages are no fun for anyone! We DO permit “spill-proof” cups, such as travel mugs, sport water bottles, sipper cups and baby bottles. We also permit bags of food on the bus, but ask that you wait until you exit before eating. All of our buses are equipped with trash bags near the front, and we ask that you deposit your trash in these bags, and not on the floor of the bus or on the ground at bus stops. We also ask that customers keep baby strollers and shopping carts out of the center isle for everyone’s safety so that others may exit the bus easily. Strollers may be positioned in the area reserved for customers with mobility devices, SO LONG AS THIS AREA IS NOT NEEDED BY A CUSTOMER WITH A DISABILITY. Remember that the front row of seats over or immediately behind the front wheels are RESERVED FOR CUSTOMERS WITH DISABILITIES or SENIOR CITIZENS. Please be prepared to give up these seats for these customers. Although personal electronic devices are permitted (cell phones, IPODs, etc.,) not everyone wants to listen to your telephone conversation or shares your musical tastes! Headphones only! 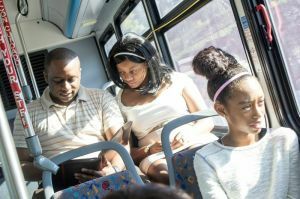 Again, for the comfort and convenience of your fellow passengers, GLTC asks that customers keep the respective volume levels low while riding your bus. Please keep conversations and language civil. Profanity or derogatory language is not considerate towards your fellow passengers. Finally, we ask that our customers wear shirts and shoes, for safety. Please tell the bus operator what kind of pass you wish to purchase BEFORE placing your money in the farebox. If you need a transfer, please ask the bus operator for a transfer when you pay your fare. Board the bus at the FRONT door; exit the bus at the REAR door. Please give up the designated seats in the front of the bus for seniors and customers with disabilities. Please do not block the center aisle of the bus. This includes BABY STROLLERS which must not block the center aisle. Signal the bus operator that you wish to stop approximately one block BEFORE you wish to exit. Generally, the bus operator will only stop at designated bus stops. Our customers are entitled to ride the bus in reasonable safety, security and comfort. GLTC will not deny service to an individual unless their actions are a clear threat to public safety, security or health, or their behavior unreasonably interferes with other passengers’ use and enjoyment of the transit system. Smoking, eating, drinking or playing loud music. Carrying hazardous materials, such as automobile batteries or flammable liquids. Transporting pets (Service Animals ARE permitted). Use of rude, disruptive or threatening behavior, including profanity. Please notify the bus operator immediately if you observe any of these actions. For your additional safety, our buses are equipped with security cameras, and all activity is subject to video and audio recording. Please do not leave personal trash (soda cans, etc.) at bus stops! Please place trash in appropriate trash containers. Our buses are equipped with small trash bags for the disposal of small amounts of personal trash. Thank you for your understanding and cooperation. By following these simple courtesies, everybody can enjoy their ride on their bus. Customers who cannot abide by these simple and common practices of courtesy may be asked to exit the bus. Repeat offenders may be barred from GLTC services.